It was confirmed on Friday evening that Maeve Donovan, 55, is to step down as Managing Director at The Irish Times after eight years in the role. Deputy Managing Director Liam Kavanagh has been tipped as a front runner to succeed Ms Donovan in the role, according to the Irish Independent and the Irish Examiner. Ms Donovan, who worked at the organisation for more than three decades, said now was a good time for a successor to lead the organisation through the next ‘inevitable wave of change’, according to a story in The Irish Times, which added that she had not envisaged staying in the role past 2010. Ms Donovan’s tenure as managing director began with a substantial re-organisation of the core newspaper business, but she is best known for the “investment and diversification” strategy pursued more recently. 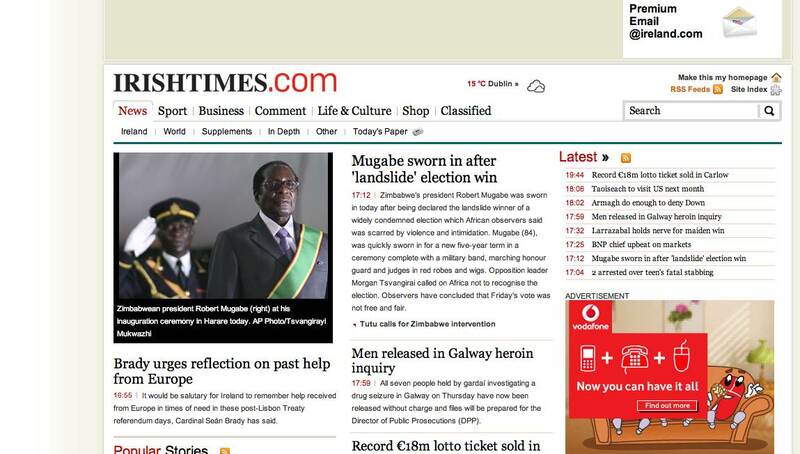 Under that strategy, ‘The Irish Times’ spent €50m on property website myhome.ie at the peak of the boom and also bought substantial stakes in ‘The Gloss’ magazine, Dublin freesheet ‘Metro’ and multi-city radio station 4fm. Those joint ventures and subsidiaries triggered more than €26m of losses in 2008 and have been slammed by the newspaper’s own journalists, who last year urged their company to “urgently review the flawed investment and diversification strategy”. I wonder how the next MD is going to handle the challenges The Irish Times, like all newspapers, faces in relation to digital change. Will it follow the NYT and Murdoch with online pay models or continue like the Guardian and stay free? It’s a difficult time for anyone to take over when surely the first task is to pull back last year’s estimated cash losses of between €1o to €11m. It’ll be interesting to watch.